Why Did I Listen To The Curiosity House: The Shrunken Head by Lauren Oliver and HC Chester? 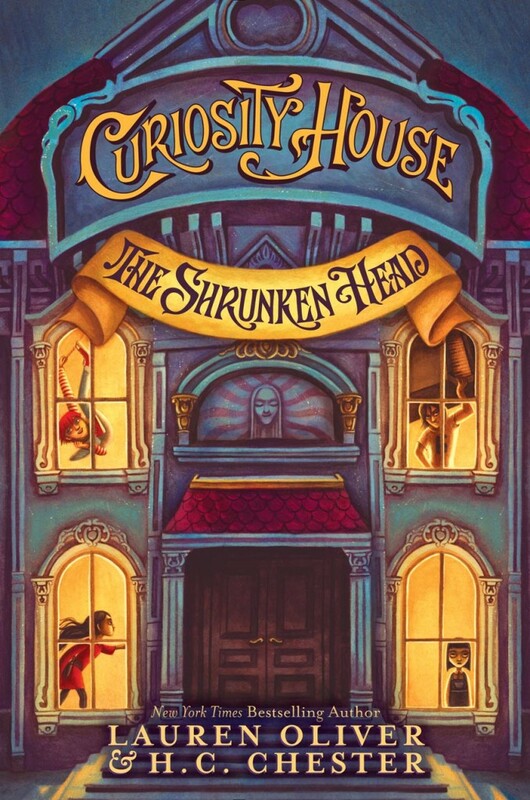 The Curiosity House: The Shrunken Head by Lauren Oliver and HC Chester was kind of a no brainer when it came to my reading it. I would read pretty much anything that Lauren Oliver writes. However, this book wasn’t really a priority for me. At least, it was not a priority until I realized I had some Hoopla borrows to use up before they expired at the end of the month. As this book was one of the shortest on my audiobook list, I decided to just go for it and give it a listen. The Shrunken Head is the first book in Lauren Oliver and HC Chester’s Curiosity House series. It follows four children – Phillipa, Sam, Thomas, and Max as a valuable artifact, a shrunken head is stolen from their home. You see, Phillipa, Sam and Thomas are orphans who were raised in Dumfrey’s Dime Museum of Freaks, Oddities, and Wonders. The three each have an ability that would make them an attraction at a carnival – like being a mentalist for one and being super strong for another. Max then joins their ranks and it turns out he can throw knives. Anyways, they all uncover a series a murders and it gets pretty real, pretty quick. In all honesty, this series opener isn’t too bad. I mean, is it my favorite of the books I’ve read by Lauren Oliver? No. However, I do not have any complaints or anything about this book. The characters each do have interesting abilities. The plot has some satisfying twists. It just wasn’t entirely up my alley and that is fine. I think that for the actual intended audience, this book is sure to be a hit. As much as I love Lauren Oliver’s books though, this won’t be a priority for me to get through the other books in the series, at least not unless in the future my son decides he wants to read these books. Then I will get back into them. The audiobook is narrated by Greg Steinbruner. I think he did a decent job. However, I did zone out from time to time, but that’s not hard to do when you’ve got a million things on your mind. In all, this is an okay listen. Definitely wouldn’t hesitate to recommend it to fans of quirky middle grade mysteries with intriguing characters.